Besides pumpkin spice lattes, my other favourite thing about fall are all the fabulous cozy fashions. Bring on the boots, sweaters and scarves, I love it all. I’ve already been checking out the store windows and looking at displays for those pieces I’d love to add to my closet to update my fall wardrobe. In some cases, I have already added them! I fell in love with this shirt the moment I saw. It was long, super soft and perfect to wear with leggings which is a staple when the cooler weather arrives. The price tag of $64.95 was a little high for me, but lucky break, the entire store was 40% off so I got it at a much better price. If you’re cheap…ahem…thrifty like I am, then sign up for the Gap’s emails and you’ll never have to pay full price, which is kind of my mantra. At first I was actually looking for leg warmers. But then I stumbled upon these very cute boot cuffs. They give you the same look as leg warmers, but when you are wearing them with boots, you won’t have a tough time closing the zipper because there is no added bulk. 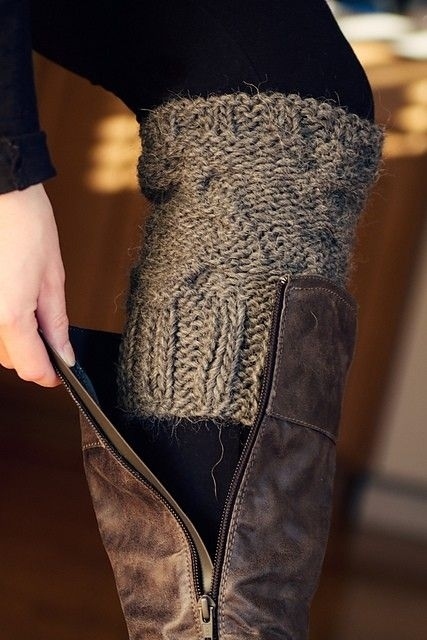 I actually found a great and easy DIY on Pinterest on how you can make these boot cuffs from old sweaters! Sometimes I get lost in a sea of neurtal and dark colors, so I like to add a pop of brightness. These red pants from H&M are perfect plus they have stretch in them, my favourite thing to have in pants ever since I became a mom. Boots are a must in the fall and winter. While I already have a black pair, I want to add a pair of tall brown boots that I can wear with leggings, jeans and dresses. These ones from Old Navy are nice and a great price! When I was packing for my overnight stay in Whistler for Mudderella, I realized I didn’t actually have a bag to take. I ended up using a suitcase which was too big! So of course that’s an excuse to go shopping. But really, a good overnight bag will be handy for years to come. Especially this cute houndstooth one I found on Amazon. 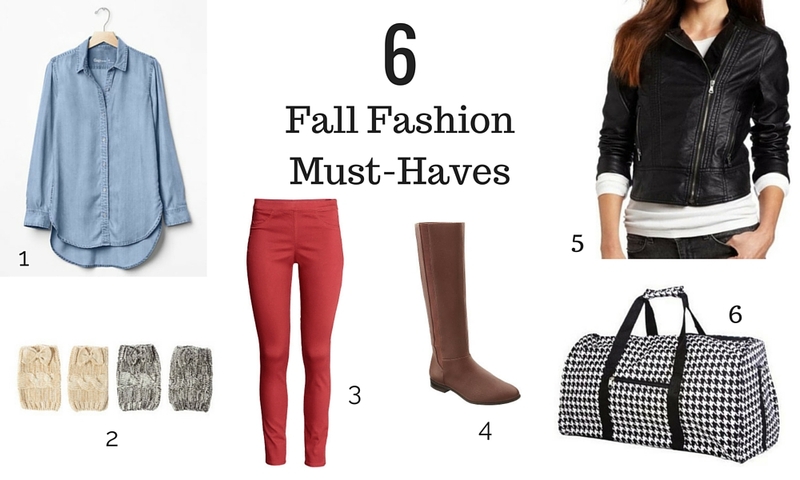 What’s on your must-have list for fall fashions? Mmmm. Looks good. I wonder how the outfit would look on a 73 year-old? The loose top would cover the stomach and bottom, the leggings would hold it all together, and the boots would give a good excuse not to walk far. As for carrying a bag–I’ll let a man handle that. Chuckle. I’ll bet you look cute though. obe everything on this list! I wear my black “leather like” jacket so much In the fall I’m sure it’s going to be a worthy investment. Love those boots! I’m in the market for new ones so def checking them out. Great picks, Salma! I have been on the hunt for the perfect leather moto jacket forever… I’m just too picky. Those leg cuffs are too cute, I’m going to have to look into those. How have I never heard of these boot cuffs before? What a genius invention! And obviously, I’m going to find the DIY on Pinterest!